I’ve been using the Kobo Aura One since it first came out last September, and then when I got the new Fire HD 8 earlier this month I was surprised by how much heavier and thicker it is than the Aura One. Both are essentially 8-inch devices so I guess I wasn’t expecting such a drastic difference, but the Fire tablet feels like a brick compared to the thin and light Aura One. At 369 grams, the Fire HD 8 requires holding with two hands most of the time or having it partially leaning against something. The Aura One only weighs 230 grams so it’s a lot more comfortable to hold one-handed, especially when reading for long periods. The Aura One is also much thinner at 6.9mm so that makes it easier to handle, compared to 9.7mm on the Fire. The numbers really don’t really tell the story, but when you have both devices in-hand the difference is massive. E Ink has a big advantage when it comes to battery life so ereader batteries are a lot smaller and thus lighter than tablet batteries. The Fire HD 8 is rated at up to 12 hours of battery life, which is pretty good for a tablet, but the Aura One can last a few weeks even when reading every day. E Ink displays also have the advantage of being easily readable in bright light, unlike LCD tablet displays that turn into a mirror when light shines on the screen. Reading on the Kobo Aura One is more comfortable on the eyes and text looks more print-like with the 7.8-inch 300 ppi screen. The Fire HD 8 is far from the best tablet for reading because it has a lower resolution 189 ppi screen. Both offer a night reading mode to filter out blue light, but the effect is quite different on the two devices, with the color being more subtle on the Fire. Obviously tablets have a major advantage with being able to install apps and being better suited for larger/color content like magazines, PDFs, and comics. Even things like black and white manga look quite a bit better on a tablet because the blacks are a lot darker, and zooming and scrolling are smoother. 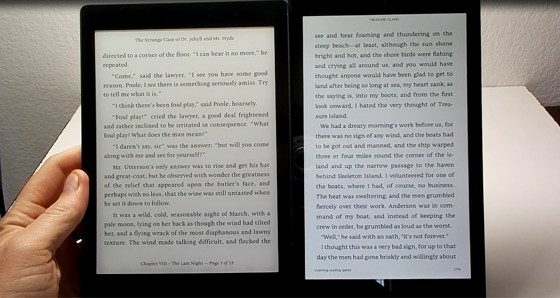 But when it comes to reading ebooks, tablets cannot match the lightweight design, the screen quality, and long battery life of E Ink ereaders. The craziest difference between the Kobo Aura One and the Fire HD 8 is the price. E Ink ereaders still cost way more than tablets and these two devices are proof of that. The Aura One is nearly 3 times the price of the Fire HD 8. The Kobo Aura One sells for $229 and the Fire HD 8 sells for $79. That’s even crazier when you consider the fact the Fire HD comes with twice as much storage space, it adds a microSD card slot, Bluetooth, front and rear cameras, speakers, and it has 3 times as much RAM and a quad-core processor instead of a single-core processor. if you really think about it; tablets and ebooks readers have come a long way in just 5 years… in another 5 years I wonder what you’ll be reviewing here? Tablets have come pretty far but not ebook readers. They’re still 90% the same as they were 5 years ago, or at least 4. They’ve been using the same processors and screens since 2013, aside from 300 ppi screens that were introduced in 2014, but the Aura HD had 265 ppi and it was released 4 years ago. Looking back at some of the older models I reviewed, like the iRex DR-800, it was way cooler than the generic plastic black slaps we get today. I still have that Nook and was playing with it other day and went back to that video for a refresher. Economics of scale is at work here also. There are way more tablets sold than ereaders, thus the manufacturing costs are much less. Also there are many more tablet users for manufacturers to get wanting the next new feature, so tablets are more cost effective to develop. books using formula (math,physics) are mutch better to read on kindle, in fact it is impossible to read most of the formula on kobo.